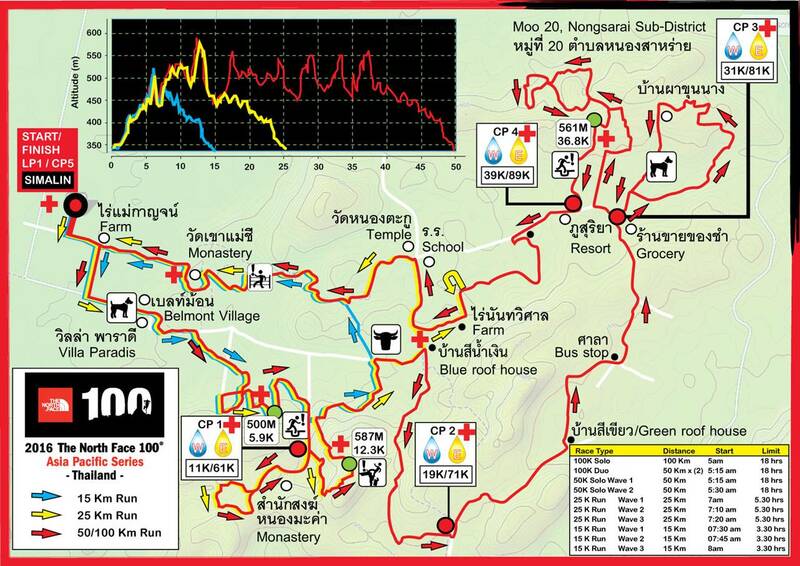 The trail run is set in the spectacularly picturesque district Amphoe Pakchong adjacent to the Khao Yai national parc and located around 150 km north east of Bangkok. The adventurous and hilly trail will lead each runner throughout mango and manioc plantations and various traditional Thai temples. The course is hilly and is compromised of 5% road and 95% trail. The 100km solo is a 2 x 50km loop, with check – points every 10km. A small tarmac road leads the runners to the wide and open scenery of corn and manioc plantations. After 1km the 50km and 100km runners split and turn right to run around a corn field and join up the 10km and 25km course again at the 4km mark. The course leads through various plantations until the 6.5km mark where the runners turn right to a small tarmac road with a short downhill part. From 7.5km until 11km the course climbs up with a steep section between the 10km and 11km mark and leads the runners through diverse plantations before a long, enjoyable descent until the 15km mark. During this downhill section the runner will cross tapioca fields and mango plantations until the course meets a small tarmac road leading through a village and temple. Trough the next kilometers the runners will have the possibility to enjoy the scenery and nature of the course. The trail winds moderately uphill from the 25km until 40km mark with a few downhill sections in between and leads continuous through tapioca and mango plantations and a small village at the 35km mark. 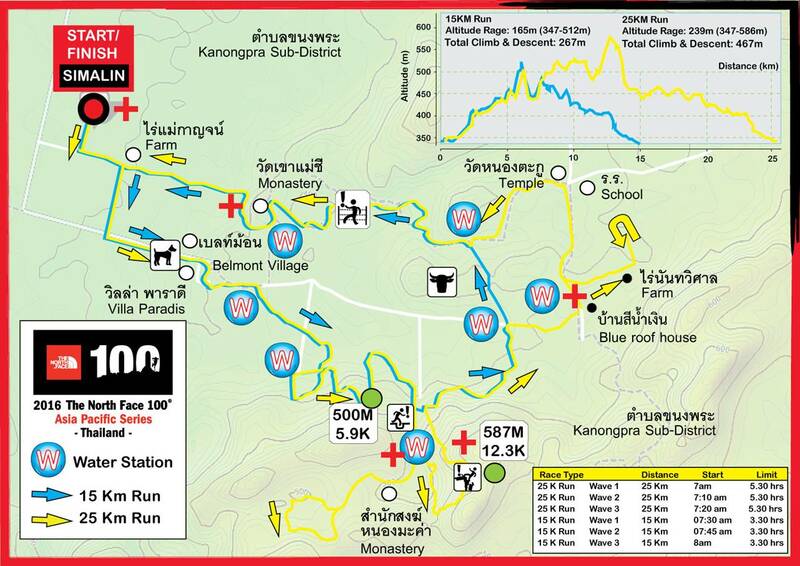 For the last part of the 50km loop the runners can enjoy a flat course and scenic run on mostly single tracks. A small tarmac road leads the runner to a dirt road through the wide and open scenery of corn and manioc plantations until the 5.5km mark where the runners turn right to a tarmac road with a short downhill part. The trail winds moderately uphill from the 10km until 15km mark with a few downhill sections in between and leads continuous through tapioca and mango plantations and a small village and temple around the 13km mark. For the last part of the 25km loop the runners can enjoy a flat course and scenic run on mostly single tracks. A small tarmac road leads the runner to the wide and open scenery of corn and manioc plantations. The course leads through different plantations until the 4.5km mark where the runners turn left to cross a corn plantation with a short up hill section. Most parts of the course the runners will run on single tracks through tapioca and corn plantations. There is a steep but short uphill section at the 7km mark. The last part of the 15km loop the runners can enjoy a flat course and scenic run.